072905m, originally uploaded by Green Biker. Ok, who's bright idea was it to stop at red lights? Freewheels? The Legal Team? Well this is the beauty of the critical mass event, it's democracy in action. If you want to try something new, work with people, work with the community...go for it. Critical mass is the place to do it, even if it is a completely stupid idea, but that is just my opinion. Supposedly this decision was made because Judge Pauley, who has been scrutinizing the behavior of critical mass, was focusing on this July ride and some people thought it would be a good example to show the judge that we follow the traffic laws of the street. This has been a major sticking point in the criminalization of the once applauded bike ride that takes place the last Friday of every month in over 300 cities around the world. This tactic worked very well in dividing the bike ride into several small sections. I really don't think our legal struggle with the city to critical mass with a permit or not should be about stopping at red lights. Maybe this worked in San Francisco back in the early days to take some of the heat off, but there they had numbers into the thousands so when a thousand bike riders stop at red lights, it makes a big impact in slowing down traffic and showing the power of a large group. This July ride was small in numbers, maybe 400 tops, although there are others who'd say it was much bigger. This basically played right into the police's hands and their tactic of divide and conquer. Now we had 8 or so groups of 20, all lost and not sure what the hell was going on. I thought we'd been through this before. Does anyone really believe the attack of cyclists has anything to do with weather we stop at red lights or not? Is a commander of the NYPD standing on a street corner decided who runs the red or not and basing his/her decision on weather the entire ride should be pounced upon by an army of cops? Come on. It is not the critical mass ride that needs to change, it is the behavior of the NYPD and the city, then maybe we can talk about red lights or not. I spent much of this ride lost with one group of 20 trying to block 7th Ave. South and having cab drivers swear at me and tell me sexual things they wanted to do to my mother. 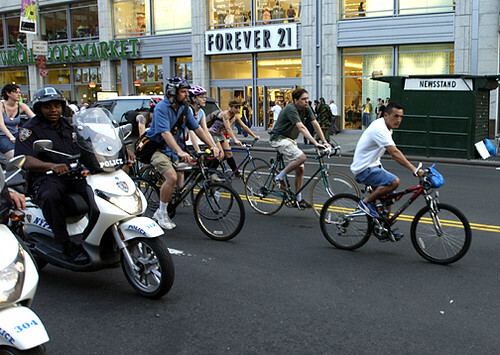 Critical Mass in NYC needs to remain tight as a group...strength in numbers. Ok, who's bright idea was it to try and go on the FDR? I want names. This is what we should be more concerned about. Another touchy situation on the legal front is that the bike ride took the FDR last July. Again, we are not big enough nor should we be putting people in more danger then the cops do when they race into the crowd with killer cars and no lights on. I was good to see people working together in spontaneous situations and evading arrest as best we could. It was also good to see people make decisions collectively and I applaud all those who chose to go downtown at Ave. C instead of trying to go on the FDR. Apparently there were 34 arrests which is a lot so it is obvious that even though we are allowed to leave the Union Square area, the NYPD has a goal of arresting as many of us as they can. This generally comes by picking off people in the back of the ride which is a sad statement, cause...someone has to be at the back. The ride made it's way to ABC no Rio in the lower east side for an after party. This was a great scene. The Rude Mechanical Orchestra played on the streets, people hung out, drank beer and were left alone by the cops. Next month is packed with great bike events, including the 1 year anniversary ride of the RNC, when all the trouble started. NEW YORK (AP) _ Police arrested at least 34 people Friday night in one of the more active crackdowns in months against a group of cycling enthusiasts who pedal through the streets of Manhattan en masse to call for more bike-friendly roads. Officers riding scooters corralled and grabbed dozens of cyclists among the hundreds participating in the once-a-month rides hosted by the group Critical Mass. The rides have been taking place for years but gained in both popularity and notoriety in the days leading up to the Republican National Convention in New York last summer. Since then, officers have arrested at least a few people during each of the rides, which are held the last Friday of every month. The city wants the group to apply for a permit to stage each ride. The cyclists say they shouldn't have to, because riding a bike on city streets is legal. Gideon Oliver, a lawyer who represents people arrested during the rides, said he had no reports of anyone being injured in Friday's arrests but complained that some riders were yanked off moving bicycles without warning. Most of those arrested will be charged with disorderly conduct and parading without a permit, police said. More than two dozen bicycle riders were arrested yesterday for pedaling through Manhattan en mass calling for more bike-friendly streets. The cyclists were among hundreds participating in the once-a-month rides hosted by the group Critical Mass for the last several years. Police officers on scooters corralled and grabbed at least 34 bicycle riders. Some were yanked off moving bikes without warning. They were charged with parading without a license and disorderly conduct. The city wants the group to apply for a permit to stage each ride. The cyclists say they shouldn't have to because riding a bike on city streets is legal. I only observed people stopping at lights when going crosstown (eg 10th St.). If the front of the ride hits a red, it's hard to bust into busy avenue traffic. You're welcome to try. I'm glad to have a quick break and let the group mass up. No one even attempted going on the FDR. We went up Ave C, then turned off on 20th. Then up 1st, where the cops had a cordon at 34th. People turned off onto 33rd, and the coprs were waiting at 33rd and 2nd. It's the cops that force the mass to break up, not the riders. Good to see you back Green Monkey! I wasnt there, but please consider 6 of the founding members of Freewheels were arrested attempting courteous mass (for one block) in Feb. AFTER being told by Cops that law abiding riders would not be arrested. The NYPD has said that since, and has since arrested, It aint about the lights, and I agree, it sounds like this ride was divided and conquered. Consider the Halloween ride, the cops gave a route, the riders threw one at the NYPD and followed the "agreed upon" route. The lead cops turned off this route, got off their scooters and arrested those bikes who had done as they were told. The PIGS are not to be trusted. but that was frustrating, one woman started screaming at the bikers calling them names... which I dindn't feel was respectful of peoples choice of risk but it was frustrating for people to move so slowly when the cops were arresting people for no reason and were not stopping at lights, this ride was slower because of the light stopping and the cops pounced.